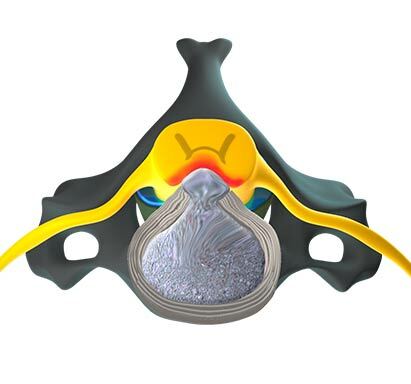 When there is a narrowing of the spinal canal, the whole spinal cord may be effective. Pressure on the spinal cord, be it from spinal stenosis or herniated disc, as it runs through the cervical spine is called cervical myelopathy. This pressure can cause weakness and spasticity in the legs where the patient may have some difficulty walking due to a loss of control of where their feet are placed. There may be numbness in both the upper extremities and lower extremities and reflexes may be increased in the legs. A loss of strength in the legs is common and they may lose their “position sense”. This is where the patient does not know where his arms and legs are if they have their eyes closed. It is important to note that the patient may have no pain if the nerve roots are not affected. The treatment is quite different depending on the cause of the myelopathy but a surgical discussion is very important. This sooner pressure is removed from the cord, the better the chance of the patient improving. It is important not to have any cervical injections or chiropractic adjustments with the diagnosis of cervical myelopathy. Certain movements, or an increase in volume around the cord, can cause paralysis. Environmental modifications (ergonomic chair, elevated desk).